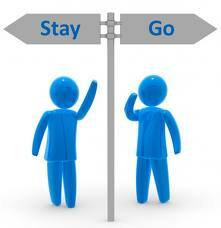 The Daily Enlightenment » Should I Stay Or Go? Home » Letters » Should I Stay Or Go? Question: I’m married and with grown children. Recently, I have a strong wish to leave them, so as to better focus on Dharma learning and practice, but hesitate due to uncertainty of how my family will react. Do you have any advice? Answer: Is your family ready for your departure? If they are not, can you get them to be ready? If you cannot, you’ll have to make peace with the situation, and continue with Dharma study and practice, while living with them. But you can continue trying to get them to be ready at the same time too. Unless very much independent in the worldly sense already, and understanding your Dharma inclinations, it might be hard for family members to understand why you wish to leave. In the context of becoming monastics, some take a long time to persuade their family to let them go. It’s quite ‘normal’. Another way is to gradually go on longer and longer retreats to get them used to your absence. However, crucial responsibilities on your side should be fulfilled first. If the situation is against your wish at the moment, why not make the best of it to touch and transform your family with the Dharma by your example at home, to make them interested in the Dharma? If your wish to leave makes them unhappy and misunderstand the Dharma instead, it would be unfortunate.